The things one sees in Williamsburg nowadays. For those of you who may not be in the know, the area around where this photos was taken (91 North 10 Street) is, depending on one’s point of view, either glorified pile of rubble or one giant construction site. This being August it is hot, quite dusty and of course: very loud. 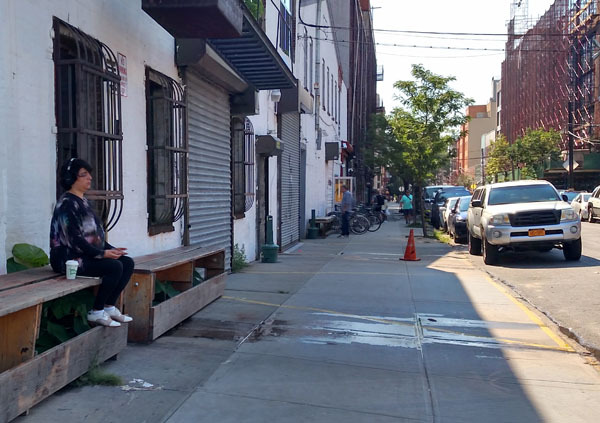 So you can imagine my surprise when I walked around the corner of Wythe Avenue onto North 10 Street nice and early this morning and stumbled upon this vision: a woman, tuned out and coffee in tow, meditating. In the background is (or at least was) Vice magazine’s office. To the right, yet another yuppie farm in progress. Need I write anything more? No, I think not.